I adore this cake and it has an unusual cooking method and flavour – similar to a yoghurt cake, the white chocolate adds a lovely creamy flavour. It freezes well un-iced. You will need two 20 cm (8 in)-diameter loose-bottomed sandwich tins, each greased and base lined with a disc of non-stick baking parchment. Measure the white chocolate into a bowl and sit on the back of the AGA to melt, stirring occasionally. (For a conventional oven, put the white chocolate into a bowl and heat gently over a pan of simmering water, stirring until melted.) Once melted, set aside to cool a little. Measure the butter and sugar into a bowl and beat with a wooden spoon until creamy and fluffy. Beat in the eggs (do not worry, it will look curdled at this stage – keep going!). Then beat in the flour, baking powder and maple syrup and stir until combined. Gradually add the milk, beating as you add it until combined. Pour in the melted chocolate and stir until smooth. Spoon into the prepared tins and level the tops. Slide the tins onto the grid shelf on the floor of the roasting oven with the cold sheet on the second set of runners. Bake for about 30 minutes, until lightly golden brown, well risen and shrinking away from the sides of the tins. Slide the tins onto the grid shelf on the floor of the baking oven and bake for about 35 minutes, until lightly golden brown, well risen and shrinking away from the sides of the tins. If the cakes are getting too brown, slide the cold sheet onto the second set of runners. Bake in a preheated oven (180°C/350°F/160°C Fan/Gas 4) for about 30 minutes. Leave to cool in the tin, then turn out and remove the baking parchment. 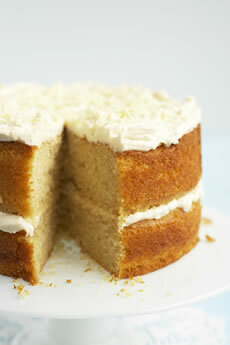 To make the icing, mix together the mascarpone, maple syrup and icing sugar until smooth. Turn one cake upside down on a plate and spread with half the icing. Top with the other cake and spread the remaining icing on top. Crumble the chocolate bar and sprinkle over the top, if using. 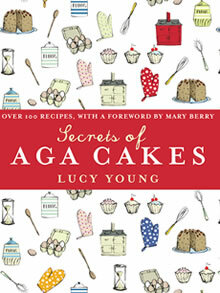 • Use a good quality white chocolate and heat it gently on the back of the AGA. You may need to sit the bowl on a tea towel if it starts becoming hot – do not allow it to get too hot otherwise the chocolate will split and become oily.